You get 5 BCW Large Silver Dollar Tubes for each quantity of 1 purchased. Each Tube holds up to 20 Silver Dollars. These work with Eisenhower, Morgan, Peace, or Trade Dollars (38.1mm in diameter). They DO NOT work with Silver American Ealges (40.6mm in diameter). 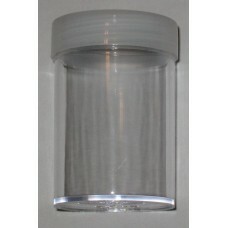 Clear polystyrene tube with a frosted screw-on lid. Do you have any questions about 5 BCW Clear Round Large Silver Dollar Coin Tubes With Frosted Screw On Cap?